Protesters at Atlanta’s Hartsfield-Jackson International airport. Photos courtesy author. Will Atlanta protect immigrants and refugees from the Trump administration? Last Sunday, seven thousand protesters descended on Atlanta’s Hartsfield-Jackson International Airport, chanting “No hate! No fear! Refugees are welcome here!” Around the nation, airports were the epicenter of protests to the Muslim Ban, the latest in a series of anti-immigrant executive orders signed by the newly anointed President Donald Trump. Atlantans showed up in force to challenge the ban, but also to demand that Atlanta Mayor Kasim Reed make Atlanta a sanctuary city by enacting policies to protect communities targeted by the Trump administration. With the stroke of a pen on the Friday afternoon prior, Trump barred entry into the United States to people with travel documents from seven predominantly Muslim countries: Syria, Libya, Iran, Iraq, Sudan, Somalia, and Yemen. The ban extended even to visa holders from those countries who legally live in the United States but were traveling at the time Trump signed the order; suddenly they were unable to return to school, jobs, and families. Those who were in transit were stranded at airports and other ports of entry, sparking outrage over Trump’s clear enactment of a campaign promise to ban Muslims from the country. In Atlanta, there were official reports of eleven people who were detained and questioned by Customs and Border Protection officers over the weekend. Mayor Reed and two Georgia congressional leaders -- Reps. John Lewis and Hank Johnson -- spent time at the Atlanta airport Saturday trying to get the eleven people released. A federal judge in New York had issued an injunction late Friday night, preventing green card holders stuck in airports nationwide from being deported. Three judges in other states made similar moves as the weekend wore on. By Saturday night, all eleven detainees at the Atlanta airport were freed. Rob Brisley, the Atlanta-based Public Affairs Officer for Customs and Border Protection, responded to inquiries about the details of what happened only with a link to the CBP FAQ about the executive order. The order also impacts refugees, who go through a two year vetting process, after being cleared by the United Nations, in order to be resettled in the U.S. For the next four months, no refugees from any country will be admitted, and refugees from Syria are banned permanently. When refugee resettlement resumes, only 50,000 will be accepted each year, down from 110,000 under the Obama administration. A sign among protesters at the Atlanta airport. “As a country, we've already resettled 36,000 refugees this year. So even when the ban on refugees is lifted, we’ll only bring 14,000 more to safety,” Amy Crownover, a spokesperson for New American Pathways, explained in an interview. The organization is one of five refugee resettlement agencies in Atlanta. The neighboring town of Clarkston, Georgia, has been called the “Ellis Island of the South,” and “the most diverse square mile in America,” for its high population of refugees from around the globe. Now these communities are living in fear. Over the past week, firsthand accounts of the executive order’s impact have come to light. Two Atlanta college students who are sisters were reportedly stuck in Saudi Arabia where they had been visiting family when the order went into effect. Hiba Ghalib, an Atlanta immigration attorney, told Scalawag that she spent last weekend fielding calls from friends, family, and clients -- all scrambling to understand how the executive order could impact them and their families. “I get questions all the time from people, but this is the first time I’m getting panicky calls,” Ghalib said. One friend called in tears, unsure whether her husband would be allowed back into the country following a business trip abroad. She’s a citizen and he’s a lawful permanent resident, or green card holder. Another Atlanta immigration lawyer, Chuck Kuck, who served as president of the American Immigration Lawyers Association, explained that both the executive order itself and the way it was introduced caused widespread concern in immigrant and refugee communities of all nationalities. “It’s not just clients from these seven countries, I’m getting calls from people from Mexico that are worried whether they can travel or not. The administration did such a terrible job in publicizing the order, in working with the agencies in charge of enforcing the order, that it caused extraordinary chaos in the immigrant communities from every country,” Kuck told Scalawag. Adding to the fear and confusion are two other executive orders Donald Trump signed last week -- one concerning the wall he wants to build at the Mexican-American border, and an order calling for 10,000 new immigration officers. 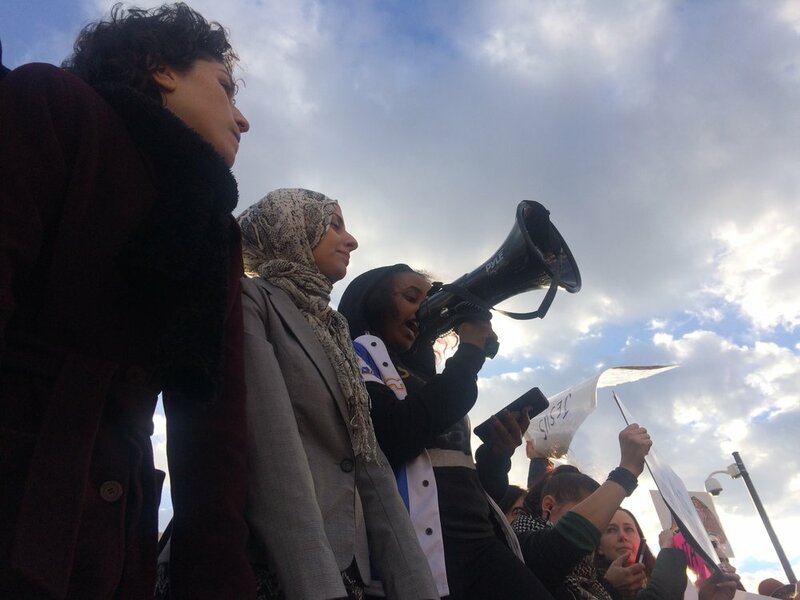 Organizers of the Atlanta rally -- predominantly Muslim women -- emphasized that these anti-Muslim, anti-immigrant, anti-refugee policies having a deep history in the United States. Protesters called for Mayor Reed to declare Atlanta a sanctuary city, and adopt specific policies to protect both undocumented and documented immigrants and refugees, as well as other vulnerable populations. When Mayor Reed did appear at Sunday’s protest, he simply reiterated his remarks from an earlier press release concerning the sanctuary city issue. According to the Center for Immigration Studies, New Orleans is the only sanctuary city in the South (though there are some sanctuary counties). Sanctuary cities are generally designated as such when local police do not work with federal agencies to enforce immigration laws. Atlanta police, however, work closely with Immigration and Customs Enforcement (ICE) to apprehend and detain undocumented immigrants. Changing this practice is one of the primary reforms Elhuni and others are seeking, though demands they recently presented to City Council members include wide-ranging reforms that Reed has not commented on. A Twitter campaign on Wednesday blasted his account with messages imploring him to heed the repeated calls for a real sanctuary city. People across the South turned out en masse in the wake of the Muslim Ban, holding rallies, sit-ins, and meetings with elected officials. On Monday, the resistance got a boost when the acting Attorney General (and Georgia resident), Sally Yates, instructed the Department of Justice not to defend Trump’s executive order. She was fired that evening. Despite the powerful pushback, the outlook for refugees and immigrants remains bleak. At the airport protest in Atlanta, Mona Megahed, the Vice President of Georgians for Syrian Refugees, relayed a conversation she’d had with a refugee mother in Clarkston whose son is receiving cancer treatment that wasn’t available in their home country.